One in three American adults (29%) has high blood pressure and only half of them have their hypertension under control. One in three American adults (31.7%) has high bad cholesterol levels and fewer than one in three of them have their cholesterol levels under control. Yet many patients have not made a decision to take prescribed medicines, or if they have, end up missing doses. Because Pro-Change programs target the entire population of patients, our programs are especially effective in improving prescription acquisition and adherence as well as increasing healthy eating, moderate exercise, and other important lifestyle behaviors. The Managing High Blood Pressure program includes a fully tailored computer intervention for the acquisition of, adherence to, and prevention of discontinuation of antihypertensive medication(s). The CTI also provides stage-matched feedback for each of the lifestyle changes required to manage high blood pressure (e.g. exercise, fruit and vegetable consumption, limiting saturated fats, moderate sodium and alcohol intake, and smoking cessation) as per national treatment guidelines from the Eighth Report of the Joint National Committee on Prevention, Detection, Evaluation, and Treatment of High Blood Pressure. 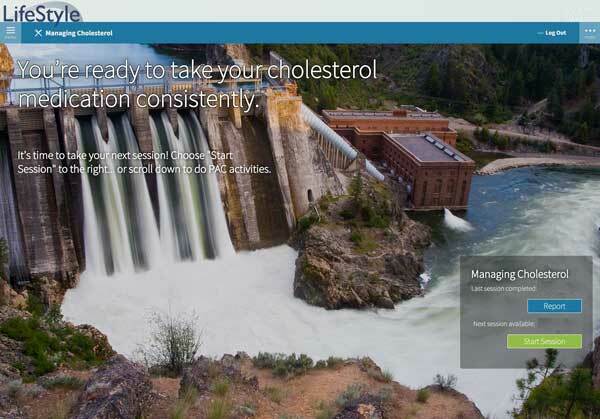 The Managing Cholesterol program provides fully tailored feedback to increase readiness to begin taking or adhere to a prescription of lipid-lowering agents, as well as stage-matched guidance on the lifestyle behaviors recommended for adults with hyperlipidemia (e.g., The Therapeutic Lifestyle Changes Diet, exercise, and smoking cessation). 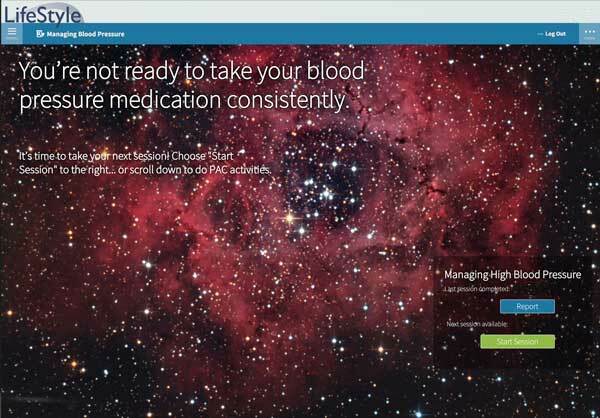 We have self-directed and coaching versions of our online Medication Adherence program. Over 1,000 members of a New England group practice who were prescribed antihypertensive medication participated in Pro-Change’s Adherence to Antihypertensive Medication intervention.1 The vast majority (73%) of the intervention group who were previously not adhering to their prescribed medication regimen were adhering at the 12-month follow-up. Developed with support from Small Business Innovation Research (SBIR) grant R44HL063481 from the National Heart, Lung and Blood Institute (NHLBI). Members of a large New England health plan and various employer groups who were prescribed a cholesterol lowering medication participated in Pro-Change’s Adherence to Lipid-Lowering Drugs intervention.2 More than half of the intervention group (56%) who were previously not adhering to their prescribed medication regimen were adhering at the 18-month follow-up. Additionally, a vast majority (85%) of those in the intervention group who were already adhering to their medication were prevented from relapsing into poor medication adherence. 1.Johnson, S.S., Driskell, M.M., Johnson, J.L., Prochaska, J.M., Prochaska, J.O., Zwick, W. (2006). Efficacy of a transtheoretical model-based expert system for antihypertensive adherence. Disease Management , 9, 291-301. 2.Johnson, S.S., Driskell, M.M., Johnson, J.L., Dyment, S.J., Prochaska, J.M., and Bourne, L. (2006). Transtheoretical model intervention for adherence to lipid-lowering drugs. Disease Management , 9, 102-114.